When All-Star voting opened for this year's game in Ottawa, Project Mayhem was launched. The idea? Stuff the ballot box with ex-Senators to stick it to the home crowd. Someone screwed up big-time, because the first six players named to the team were announced today, and four of them are current Sens. Jason Spezza, Daniel Alfredsson, Eric Karlsson and Milan Michalek all made the starting lineup, with Michalek landing 300,000 votes in the final five days of voting to surpass Phil Kessel. This happened because Sens fans came out in force, or because the league rigged the voting, or maybe just because the Leafs cannot protect a lead. The thing is, none of these players are bad, just not deserving of the first ballot. And the bigger thing is, who cares? Let them have their fun. 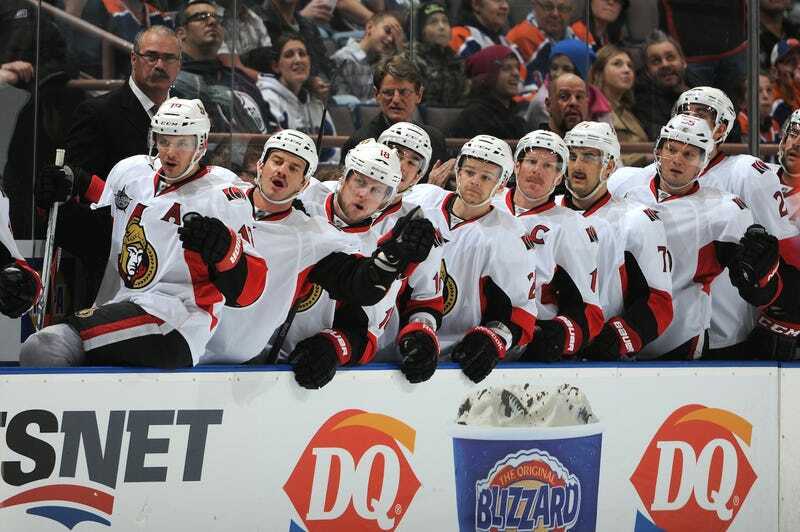 Considering Kessel, Joffrey Lupul and James Reimer just missed out, are we really going to begrudge Sens and Leafs fans for spending another long Ontario winter stuffing the ballot box, instead of drinking themselves to death like usual?